Seton's Toilet Signs are backed by our 100% Satisfaction Guarantee! Select from a wide variety of Toilet Signs at competitive prices. Plus most of our top-quality Toilet Signs are in stock and ready to ship today. 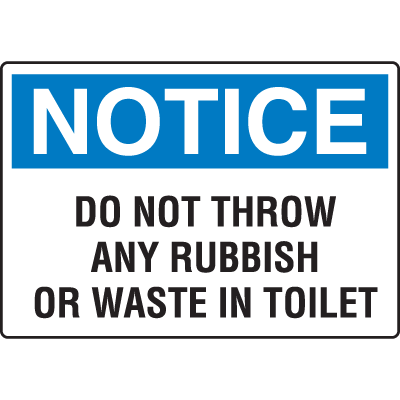 No rubbish in toilets signs enforce restroom cleanliness. Make it easy to identify unisex (“transgender") restrooms in your facility. Explore Seton’s wide assortment of gender-neutral ADA Braille signs for your toilets, washrooms, bathrooms, water closets or whatever you want to call it!